Walk to International School of Paphos! Paphos, Cyprus - This modern and spacious two bedroom, two bathroom apartment is located in a prime location just outside of Paphos town and within easy walking distance to the International School of Paphos making it a very sought after location. The apartment is very spacious and well laid out with all modern fixtures and fittings. The living room has sliding patio doors leading out to the large covered veranda that features stunning sea views making it a lovely spot for outdoor dining! The kitchen is well equipped with all modern appliances and has plenty of counter space and storage space with lots of cabinetry. The two bedrooms are double sized with fitted wardrobes and air conditioning in both. The master has access to the balcony and lovely views. There are two full bathrooms - one with a shower stall and the other with a full bath. Both are finished with nice quality fittings and in a nice, neutral colour. 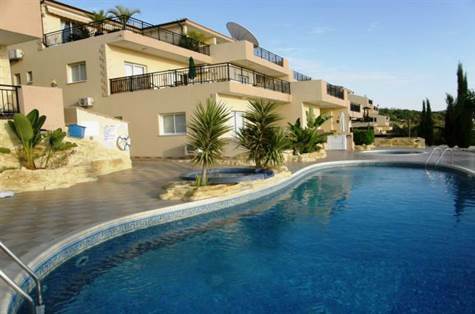 The development itself is small and well maintained with a very nice communal swimming pool featuring a jacuzzi and a separate children's pool all overlooking the wonderful sea views. There are plenty of sunbeds and the area is nicely landscaped with palm trees and other tropical plants and bushes. This property has been lovingly maintained by the current owners and would make a great permanent home for those wanting easy access to town or school.